The Portland metro region earmarked nearly $84 million last year on matters of housing and homelessness. But exactly where is all this money going? Who is it helping? And finally, is it doing any good? The Multnomah County’s Department of County Management Evaluation and Research Unit had the same questions, and recently completed its first analysis of money spent on homeless services in the region. It could be the first to marshal together dollar figures and other data from numerous budget documents to show how much money is being spent, through which government agencies, for what programs and segments of the homeless population. “To the best of my knowledge, this is the first time a comprehensive review of expenditures that has been done,” said Marc Jolin, director of the Joint Office of Homeless Services. The analysis, he said, and the way it is organized will allow the Joint Office and other policy makers to answer more specific questions about how money is spent, which programs are the most fiscally effective, and which are not. The purpose of the spending analysis was to answer how spending and programming shifted since the creation, in 2014, of A Home For Everyone. A Home For Everyone is the advisory body made up of homeless and housing experts that oversees homeless policy and services in Multnomah County, including advising the city-county Joint Office for Homeless Services, setting out what homeless services should be prioritized, and making budget recommendations. The body was created four years ago to allow various government, policy and nonprofit entities to collaborate more efficiently, as well as to create a county-wide strategy for ending homelessness that replaced the previous 10-year plan. The analysis concluded that spending matches the priorities and goals set out by the advisory body when it was launched. The county reviewed how much money was spent each year – not budgeted – between 2014 and 2017 by drawing on budget documents and other data from a variety of government bodies and agencies, including the cities of Portland and Gresham, Multnomah County, the Joint Office, the Portland Housing Bureau, and the region’s public housing authority called Home Forward. It also categorizes spending in various programs, including rent assistance, homeless prevention efforts and case management. 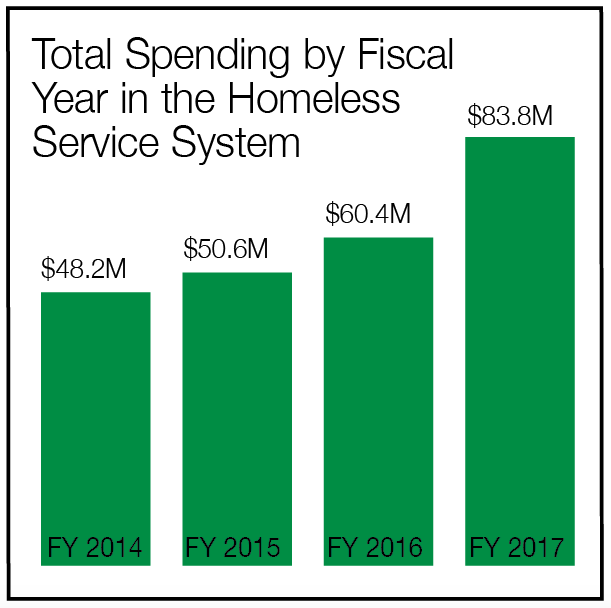 The audit further breaks down spending on subpopulations within the entire homeless population, such as homeless women, families and racial and ethnic groups. “It’s a level of specificity and detail that we haven’t been able to have before,” Jolin said. The analysis is available through a software program called Tableau, which allows data to be presented in an interactive manner. It’s available on A Home For Everyone’s online dashboard at ahomeforeveryone.net. Data from 2018 was not available when the analysis was conducted, and spending for building shelters, staffing and operation costs at governmental agencies such as the Joint Office of Homeless Services or the Housing Bureau, or public safety costs were not included. Early on, the priorities set out by A Home For Everyone included programs that place homeless people into housing, as well as programs that help people stay in their existing housing and preventing homelessness. As the Portland area began to experience rising rents and a lack of affordable housing, A Home For Everyone began prioritizing programs that kept people in their housing and prevented them from becoming homeless. Throughout the past four years, A Home for Everyone has also prioritized “safety off the streets,” which includes shelters and other short-term programs that prevent as many people as possible from sleeping outside. The Joint Office of Homeless Services and the social services it works with have opened hundreds of year-round shelter beds, bringing the total number of year-round shelter beds up to 1,651. The county’s 2017 Point in Time Homeless Count tallied 4,177 people experiencing homelessness. Of those, 1,668 people were found sleeping outside. Both those figures are widely recognized as undercounts, and represent only a fraction of the individuals and families needing housing assistance. During bouts of cold weather, as many emergency shelter beds open as possible to accommodate any homeless person seeking shelter. The analysis shows exponential increases in spending for homeless programs. That reflects how homelessness and affordable housing have become hotly contested political issues in the Portland area in the last few years, during a time when the city faces a dire shortage of affordable housing. Between 2014 and 2017, total dollars in spending for homeless programs increased by 70 percent, from $48.2 million to $83.8 million in 2017. Services for shelters more than doubled, from $7.2 million in 2014 to $15.4 million. The largest increase in actual dollars went to supportive housing programs, which combine services such as case management, mental health treatment, or programs for drug addiction with housing. Funding for those programs increased by $12.5 million in the four-year period. Total spending for programs that placed homeless people into housing increased by 74 percent and spending for programs that prevented people from becoming homeless increased by 64 percent. Rental assistance programs also saw big spending increases. Rent assistance, which pays a certain percentage of a low-income person’s rent for a short or long-period of time, is considered one of the most effective ways at keeping people in housing. Rent assistance spending increased by 67 percent, from $13.9 million in 2014 to $23.2 million dollars in 2017. Spending on flexible rent assistance – money that is used to pay for move-in costs, such as a security deposit representing the first and last month’s rent – increased by 117percent in the three year period, from $6.1 million to $13.4 million. Spending on the program represents 16 percent of total spending. Other programs where funds can be used flexibly also saw big spending jumps. A spending area called “client assistance,” which allows case managers to help their clients get new state identification, pay for vehicle repairs or other basic needs that would help them prevent or end their homelessness, increased by 308 percent, from $223,403 to slightly under $1 million. The analysis also breaks down spending by specific populations within the total homeless population. Assisting homeless families is one of the biggest priorities of the Joint Office. Spending for programs directed at homeless families – including shelter, rental assistance and housing placement – increased by 417 percent, from $6.1 million to $14.6 million. Spending on veterans programs increased by 149 percent. Programs for homeless women saw spending increase by 190 percent. Funding for different racial and ethnic groups within the homeless population—including African Americans and Native Americans – increased by 510 percent, reflecting an ongoing emphasis from A Home For Everyone to address racial disparities within the homeless population. The analysis also shows how each body of government in Portland has increased its spending on homeless services. The city of Portland increased spending by 129 percent. Multnomah County’s spending increased by 88 percent. One of the smallest increases is spending from the federal government, at 46 percent. Jolin, who oversaw A Home For Everyone as the body’s coordinator before becoming the director of the Joint Office of Homeless Services, said the analysis is another way for A Home For Everyone and the Joint Office to hold itself “collectively accountable” when looking at how well the groups are addressing homelessness. “It’s important that we’re living up to that commitment, to really monitor our work and make sure that we’re aligned with the goals we set for ourselves,” he said. He said the analysis will likely be used to help develop future budgets and analyze programs and program spending in a “more refined” way. “Given the months of review and legwork required just to put this version together,” which took months of obtaining various budget documents, it’s unlikely that such a detailed spending analysis will be done each year,” said Denis Theriault, spokesperson for the Joint Office of Homeless Services said. “Replicating it would probably require additional staff or investment”— a spending increase unlikely to happen.